Who is the most powerful fictional character that Kenshiro can defeat? 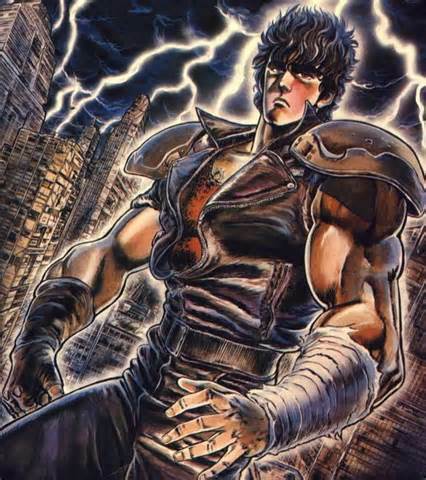 As the title asks, who is the strongest fictional character that Kenshiro (Fist of the North Star) can defeat? I'm just making this out of curiosity, and to get back into the swing of things, so lets get creative with this. Rules: no naming characters who could obviously stomp Ken, and sae thing vice versa. Also, Ken is bloodlusted. Oh, and speed is equalized. Round 1: Ken has knowledge on his opponent, Muso Tensei is restricted. Round 2: Ken has no knowledge on his opponent, Muso Tensei is NOT restricted. Re: Who is the most powerful fictional character that Kenshiro can defeat? I guess Whitebeard from One Piece would be a decent start. Can't remember much besides Musou Tensei and his Hypersonic+ feat of catching 1000 punches per second. Kenshiro wouldn't realize what is happening to him. Location : Why should I tell you !? GOKU SSG if he is not paying attention right???? Othus wrote: GOKU SSG if he is not paying attention right??? ?